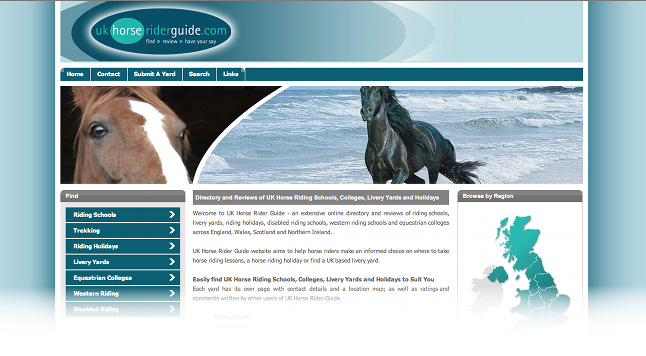 This website runs on community spirit - it lists every (well you can never be 100 % sure so lets say 'almost' every) Livery Yard, Riding Stable, Equestrian Centre and Disabled Riding facility in the UK. It allows the website visitors to search for them by postcode, town or county so whether you've just moved to an area or are on holiday, you can look up at places to ride near you. But it gets better, you can get a feel for those riding centres by reading the reviews that previous riders have left about the place. And then you can add your tuppence, leaving your review of your experience after you've ridden there - this in turn goes on helping the riding community share and discover great places to ride! This site is hugely popular with the riding community receiving over 30,000 visits a month- why not see what it's all about! Equestrian retailers can advertise either nationwide or in a specific area. Due to the scale of listings and number of advertising slots available UK Horserider are able to keep their advertising package costs low which in turn helps the advertiser and the take up rate. For retailers UKHorserider can add and manage equestrian specific adverts either on UK wide or county specific pages within the website. With over 100 counties and regional areas throughout the UK and up to 3 advertising spaces per page this gives UK Horserider a sustainable advertising income stream, and for their advertisers mean that they can offer very reasonable advertising packages from as little as £50 for 6 months. If you own a website which wants to look at boosting its income stream through advertising revenue why not give us a call to see how we might be able to help.